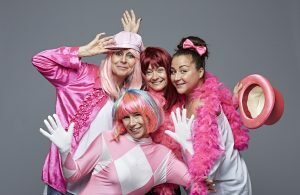 This October, Breast Cancer Now is encouraging the UK public to dig out their pink glad rags for their flagship fundraiser, wear it pink, on Friday 20 October. The fundraising event, back for its 16th year, encourages supporters to hold events in their homes, schools and workplaces on Friday 20 October and make a donation to Breast Cancer Now to help the charity achieve its aim that by 2050 nobody will die from breast cancer. The charity’s flagship fundraising day started in 2002 and has so far raised over £30 million for vital breast cancer research. Johnny Devereaux started supporting Breast Cancer Now after his sister was diagnosed with secondary breast cancer in 2013. Since then he’s taken on challenges and marathons to raise money for the charity’s research and this year he will be dressing up in pink for the day to take part in wear it pink for the fifth time. “I will be wearing it pink this year. Quite simply, I take part because it’s easy and it’s great fun to do. You don’t need to train and you can be as creative and as crazy as you like. “As well as raising vital funds for research, the day is a great way of getting the message across to people who may not be aware of the statistics, risks or warning signs relating to breast cancer. “Wear it pink is a brilliant opportunity for individuals, groups, co-workers and families across the UK to fundraise together. There are so many ways to get involved, from holding a pink cake sale or sports day in the office or at school, to having a pink party at home with your friends. Whatever you do, you’ll be raising money for Breast Cancer Now’s life-saving research. “Right now breast cancer is at a tipping point. Every year in the UK around 50,000 women are diagnosed with breast cancer, and sadly around 11,500 women and 80 men will lose their lives to the disease. This is why we are urging everyone to get involved in wear it pink this Friday 20 October to raise funds for vital breast cancer research, to stop breast cancer taking the lives of those we love.